CAREERS & the disABLED Magazine, established in 1986, is the nation's first and only career-guidance and recruitment magazine for people with disabilities who are at undergraduate, graduate, or professional levels. Each issue features a special Braille section. 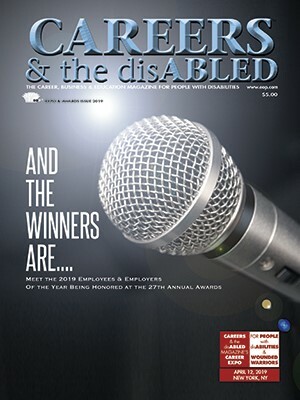 CAREERS & the disABLED has won many awards, including several media "Award of Excellence" acknowledgments from the President's Committee on Employment of People with Disabilities. This magazine reaches people with disabilities nationwide at their home addresses, colleges and universities, and chapters of student and professional organizations through a paid subscription. At the same time minority business enterprises (MBEs) continue to increase their impact in the U.S. economy, there are a number of ways your MBE could get a competitive edge, according to Washington, DC-headquartered Minority Business Development Agency (MBDA), mbda.gov. 1. Minority Business Enterprise ● National Minority Supplier Development Council, nmsdc.org: The NMSDC connects certified, minority-owned suppliers with thousands of corporate members, providing access to influential private-sector buyers. Additional MBE benefits include eligibility for NMSDC development programs and invitation to networking events. 2. Disadvantaged Business Enterprise ● U.S. Department of Transportation (USDOT), transportation.gov: USDOT’s Disadvantaged Business Enterprise (DBE) program offers small businesses owned and operated by socially and economically disadvantaged individuals the opportunity to compete for federally funded highway, transit and airport contracts. 3. 8(a) Business Development ● U.S. Small Business Administration (SBA), sba.gov: With a goal of awarding at least 5% percent of annual contracting dollars to small disadvantaged businesses, the federal government established the 8(a) Business Development program. Participating companies can compete for set-aside contracts, form joint ventures with other firms and receive assistance navigating federal guidelines. Learn more about the program benefits on the MBDA blog. 4. Women’s Business Enterprise ● Women’s Business Enterprise National Council (WBENC), wbenc.org: The WBENC facilitates partnerships between certified Women’s Business Enterprises (WBEs) and corporate partners, allowing access to suppliers and procurement executives at thousands of organizations and government entities. WBEs are eligible for federal contracts, access to mentoring and capacity development, and use of WBENC marketing and promotional materials. The Veterans Affairs Office of Small and Disadvantaged Business Utilization counsels, assists and protects the interests of veteran-owned enterprises. The office’s Vets First Verification Program affords veteran and service-disabled, veteran-controlled firms the opportunity to apply for earmarked and sole source contracts. The Historically Underutilized Business Zone (HUBZone) program offers federal contracting preferences to companies operating in areas with proven economic needs, including rural counties, Indian lands and disaster areas. Explore the map of qualified HUBZones to determine if your business is eligible for the certification.